It will be a year of changing of the guard in Brussels. But there will be absolute astonishment in political circles if Phil Hogan does not get the nod for another five years as Ireland’s EU Commissioner. We are facing the most challenging years in the EU’s existence, and Ireland has the most of any member state to lose from the upcoming challenges. Phil Hogan hit the ground running when he landed in Brussels in November 2014 and he sailed through the inquisition by MEPs who ratified his appointment to the EU executive. The post of Agriculture Commissioner remains a pivotal one. It has direct control of almost 40pc of the EU’s €150bn per year budget. Realpolitik says that sooner rather than later somebody needs a favour for their agrifood sector or rural development problems. Favours done can often be called in later. Even critics of the Kilkenny giant acknowledge that he can do the wheeler-dealing with great skill. The EU Commission is a nothing-for-nothing world, and it is all about networking. 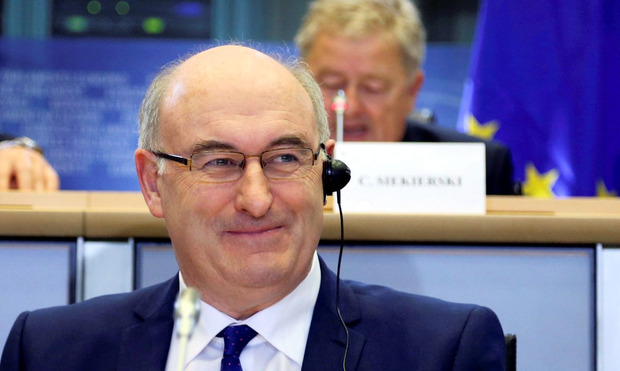 There are three good reasons why Phil Hogan is in pole position to get another five years. First off he is rated as having done a good job in Brussels and internationally. Secondly, he is well got with Leo Varadkar, who has the giving of this job. Hogan helped the Taoiseach in his leadership campaign in 2017, offering wise counsel and bringing his considerable influence within Fine Gael to bear. Finally, given the tight parliamentary arithmetic, even if the Taoiseach wanted to reward or exile one of his lieutenants, he could not afford to risk a by-election he would surely lose. It also makes sense to keep somebody who knows the Brussels workings in situ at a time of considerable change. There is a case for Hogan retaining his agriculture portfolio and continuing the reform agenda he began. But there is also the prospect of another senior post such as trade commissioner. There is precedent here because in the 1980s, Frans Andriessen of the Netherlands served first in agriculture and then moved on to take charge of competition.